July | 2011 | Wait... What? In May 2008, I started a ‘secondment.’ I was loaned out from Plan’s US office to Plan’s West Africa Office for a year to work on the Youth Empowerment through Technology, Arts and Media (YETAM) project, which at that point was funded by Nokia via Plan Finland. My ‘social media guru’ friend DK and my colleague Lisa suggested I start blogging. So in June 2008, I wrote my first post on Wait… What? Reading it is a good reminder of how much you can learn over 3 years, even when you think you already know something. That first year of posts is kind of embarrassing, but in a way I’m glad they are there as they make for a good baseline when assessing my own personal and professional growth since then. 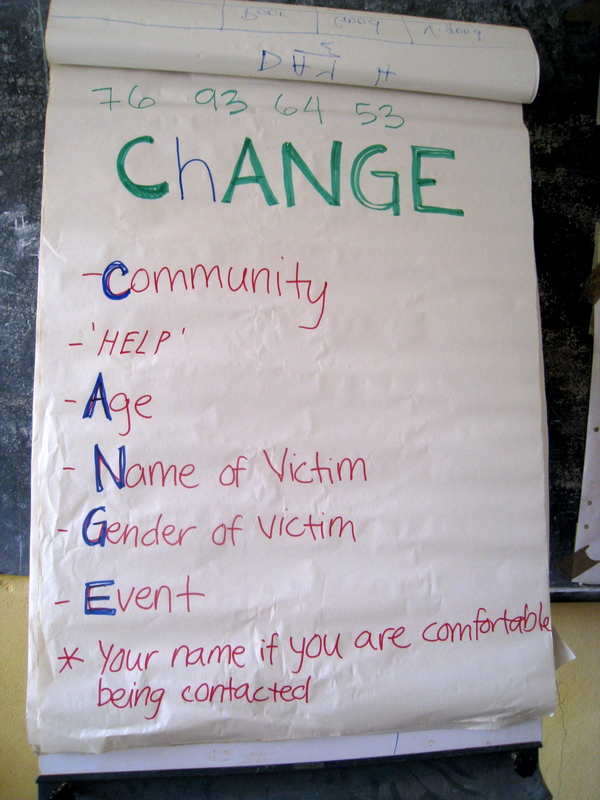 In December, 2008, my colleague Mika Valitalo (from Plan Finland) and I organized a week-long ‘Social Media for Social Change’ workshop in Kenya. I had been reading White African’s blog and doing a lot of internet research alongside more direct work on YETAM in Senegal and Rwanda. Mika and I had been discussing Ushahidi, FrontlineSMS and Global Voices. So we decided to invite them to our workshop. I honestly assumed they wouldn’t bother responding as we were not doing much with ICT at that point. To our surprise, Erik Hersman, Ken Banks and Juliana Rotich all agreed to come. In addition, we invited Tonee Ndungu from Wazimba and Daudi Were from MentalAcrobatics. The meeting was a real eye opener and set the groundwork for much of what happened since with social media and ICTs at Plan. After I went home from the meeting in Kenya, at the suggestion of Erik and Ken, I started a Twitter account. (I was so skeptical that I used a pseudonym). But from there things pretty much started happening. A whole world of learning, discussion, writing, commenting, partnerships, face-to-face meetings and new friendships with those working in development and in ICTs opened up. I got involved with the @smart_aid group and different m4D and ICT4D networks like ICT_Works, Mobile Active and most recently Africa Gathering and they have taught me so much. A year turned into 2 and then 3. The focus of the secondment expanded to look at the use of social media and new technology in different aspects of our programs in Africa and I had the opportunity to be involved in some really interesting projects. It turned into ‘information and communication technology for development’ or ‘ICT4D’ in general, and to helping develop a strategy at the global level for strengthening our work both internally and with youth, communities, and local partners in these areas; mostly all documented here on this blog. I was lucky to report directly to a boss (Stefanie Conrad) who was creative, flexible and supportive of new ideas and initiatives and who always asked ‘what obstacles are you facing? how can I help move them out of your way? what support do you need? how can I improve my support to you?’ I was also lucky to work closely with Mika, the point person from the donor side. Mika really knows his stuff, but he also knows that no matter how much he knows, he needs to learn from people on the ground, and he takes the time to visit, to stop, to listen and to be sure he understands. He’s aware that process is critical and that things take time. Not to mention he is just a cool guy all around. I had the pleasure of working with some fantastic people from our different offices across Africa and the opportunity to meet many of the people who are moving and shaking the world of development and ICTs on the continent and beyond. There were challenges (there are always challenges) and I’ve been plagued with doubt about development and where it’s headed at times (as I think I will always be) but looking back, it’s been a life-changing 3 years and I’m sad to say that as of June 30, my secondment ended. When I went on secondment for the first year, I knew that I was taking a risk and that Plan US would not hold a job for me to return to. I also knew that I probably wouldn’t want to return to my old job anyway because I really needed a change. As the secondment comes to a close, I know that taking the risk was worth it in every way. Not only was it worth it, but Plan’s USA has welcomed me back into a new position as their Senior Advisor for ICT4D where I’ll have the chance to put the experiences and networks that I’ve been accumulating over the past 3 years to work in a new context. Plan US has probably changed as much as I have over the past 3 years so it’s an exciting time to be returning. As for the job itself, the plan is that I’ll be building on the work I’ve been involved in over the past 3 years and will continue to support to some of the initiatives I’m currently involved in, but from the Plan US side rather than from the Plan West Africa side. I’ll spend about half of my time with the program and grant writing teams; a third of it supporting program-related communications and efforts to bring stories and voices directly from the youth we are working with to the US public through new media; and the remaining portion supporting research around youth and ICTs and helping put Plan’s global ICT4D strategy and capacity building plan into practice. It will be fun to re-read this post in another three years and see how much I’ve learned by then, compare what the job description is now and what it may have morphed into, and whether my thinking today sounds horribly naive and out of date. Thanks go out to everyone I’ve met (live or virtually) and had the opportunity to work with over the past 3 years; it’s been life altering. 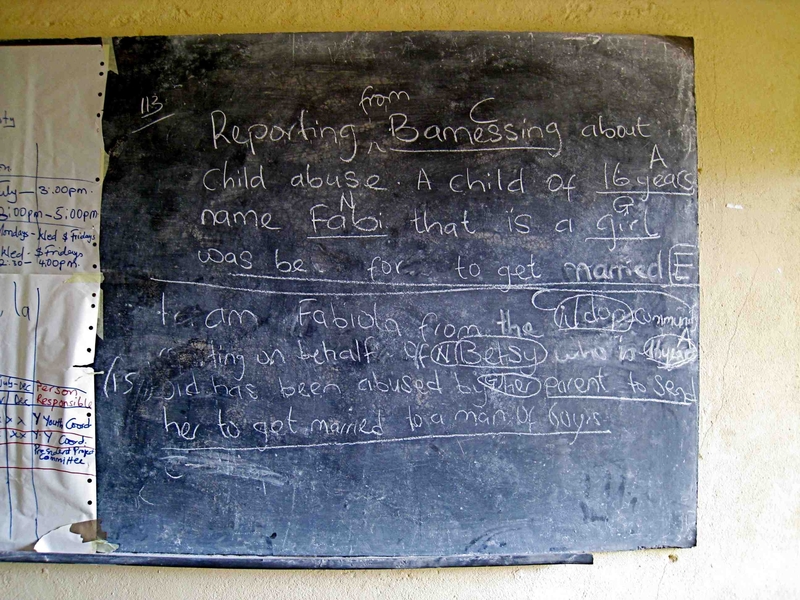 This is a first guest post by Jacqueline Deelstra, who is working for about 2 months to support Plan Benin to solidify their SMS Reporting and Tracking of Violence against Children (VAC) project. The VAC Benin project started as a pilot in February 2010. Plan Benin welcomed Paul Goodman (see earlier posts) for the month of May to support refining and optimizing the actual SMS and mapping system, and Jacqui is now spending 10 weeks looking further at the non-technological aspects that underlie the initiative, including staff training, links with government duty bearers, and community input around the idea and practice of SMS-based reporting. In coming to Benin for two months as a consultant to work with Plan staff on a project using FrontlineSMS and Ushahidi to collect and map citizen reports of violence against children (explained previously in this blog) I knew part of my work would be training staff in the technology and answering their questions about how it works and what it’s good for. In other words, that this work would fall under the often discussed buzz phrase “capacity building” for local staff. And certainly, many questions have come to me about aspects of the technology. 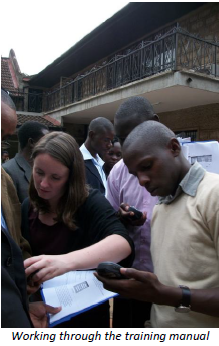 For example, how data from Ushahidi can be downloaded for analysis and to make graphs for reports and how staff without access to Ushahidi as administrators can use the public site to submit cases of violence that are reported to them in person as opposed to being submitted directly from the reporter to our Ushahidi platform via our SMS helpline. During the recent trainings I carried out in Cotonou on Tuesday and Wednesday I was able to demonstrate to staff members the features of Ushahidi, but just as important was the chance to field a lot of interesting comments and questions. As this was the first time many staff members had seen the vacbenin.ushahidi.com site, it was a process of discovery. There was resulting curiosity about things I had just taken as given in the system. Comments were made about how we are currently processing reports of violence received by SMS by classifying them into certain categories and specifically why we chose the categories we did for the type of violence and location. The categories we have are listed below. Location– At home, at school, at work, in the community and in institutions. You will see next to categories right now there is the statement: “Select as many as needed.” Everyone knows it is difficult to classify many things into just one box. Thus, with cases of violence such a forced marriage it was initially decided that multiple boxes should be checked because it certainly entails sexual and physiological violence and potentially physical violence, and we wanted to cover all our bases. Finally, in our discussion of the choice of locations when processing a report, questions come up about why “at work” was chosen, when other locations more specifically of interest to staff, such as the market, were not included. (Note: the original categories were taken from the UN Study on Violence Against Children, which provides the framework for the overall program.) Staff explained that markets are known to be dangerous places for children who work in them and thus they would like to see if reports come in specifically about that. They also discussed their feeling that “at home,” is too vague. Violence at home could be committed by parents against their own children. Or it may be violence committed against domestic workers or other children living in the household, which they have the impression happens frequently. But the category “at home” does not provide any insight into that question. The clear value of this discussion of categories and what information would be of most use to the local staff points to another buzz phrase in development, “participatory methods for program design, monitoring an evaluation.” Without consulting various staff members and getting that local knowledge about what issues a project should be tracking and addressing, it is likely the project will not be as useful and impactful as it could be. Especially with a project like as this one that is gathering data for the sake of advocacy, awareness raising and informing future programming, the way data is collected and classified has to fit the local needs and context. Thus in my trainings this week it was certainly not only the Cotonou-based staff that learned something. I learned more about what types of violence are of interest to staff and how we can make this project work better for them by better meeting their information needs.